The 49-Mile Drive Has a Cute Sign, but What's the Big Deal? The 49-Mile Drive may be one of San Francisco's oldest marketing ploys, created in the early 20th century to show off the city to new drivers. Why is it 49 miles long? It's all about the city's size: 49 square miles. Why Should You Take the 49-Mile Drive? This scenic drive is a nice way to see more of San Francisco than you can on foot. This modified version of it will take you past some things you might not have known about: A buffalo herd, a pet cemetery, San Francisco's dreamiest photo spot, and a Dutch windmill are just a few. It takes about 4 hours of driving to cover the route, starting in Union Square and ending at City Hall. We tested the route on a holiday when traffic was light and didn't stop anywhere for more than a minute or two. If you start at Bay and Van Ness instead, make a normal number of photo stops and take an hour for lunch, it will take most of a day. 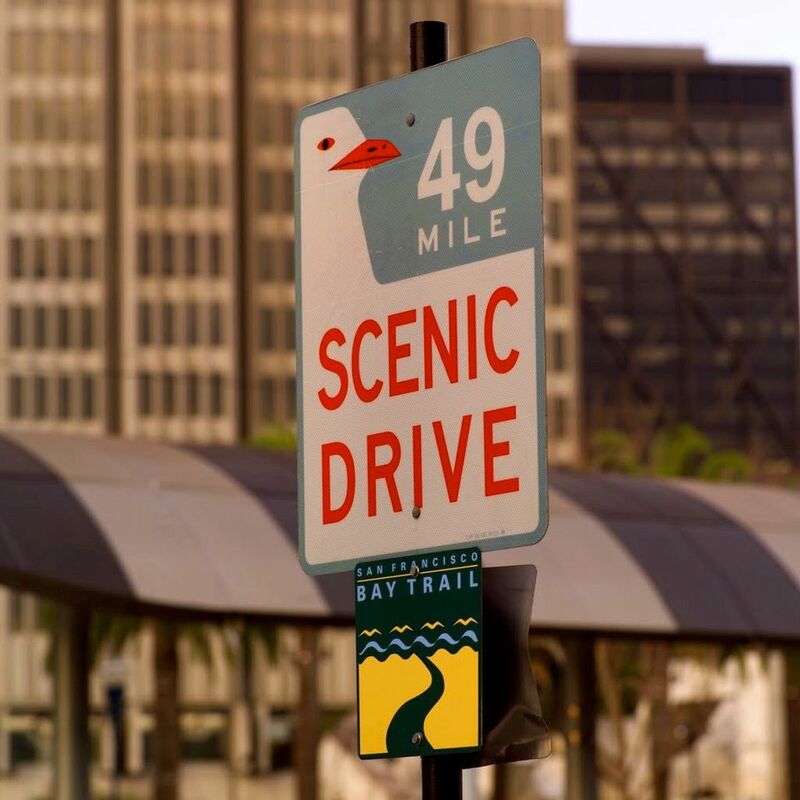 If you want to "do" the 49-Mile Drive, you'll follow signs that look like the one above. Unfortunately, that seagull is just a little too cute. People routinely steal the signs, which causes a lot of confusion if the one that's missing is the one you need. The City of San Francisco makes it worse, too. They seem to think you should only do the drive counterclockwise. If you want to go in the opposite direction, forget the signs. A map is your only hope. Even if you drive in the "correct" direction, signs may be missing. In fact, you can find plenty of online reviews from people who were frustrated looking for them. The bottom line: You need a good map or mobile navigator to enjoy the 49-Mile Drive without frustration. You can see the whole route on the map at the end of this guide. You can also use the Google map to plot your course or follow the written directions on each page of this guide. Just a note: If you happen to use Google's 49-mile Drive map, beware. Their suggested route looks like it was designed for easy driving, and not for seeing all you can. It misses many interesting sights by just a block or two. And it skips the most interesting part of North Beach entirely. Follow the route outlined here starting at Bay and Van Ness or check our Google map. You'll skip the boring parts, so you have more time for the best ones. It's better to see some parts of the 49-Mile Drive on foot than in an automobile. If you try to drive it, you'll have to navigate one-way streets, dodge double-parked cars and handle traffic congestion. It's all so distracting that you won't have time to see much. Between the walking and the skipped (but uninteresting) parts, you'll turn the 49-Mile Drive into something more like 20 miles. To get started, set your mobile device to take you to the Palace of Fine Arts. Or enter 3526 Baker St which is just across the street. The Palace of Fine Arts is the only structure remaining from the Panama-Pacific International Exposition held in San Francisco in 1915. It looks like an ancient temple, sitting beside a small lake. It's a lovely place, but you'll only need a moment or two to take some photos before you continue. Point your mobile navigation to the Disney Family Museum at 104 Montgomery St. The headquarters of George Lucas' Lucasfilm and the Industrial Light and Magic company are on the right in the Letterman Center. Visitors can't go inside the buildings, but you can stop to see the Yoda statue and walk on the grounds. Don't let the security guard worry you - just drive up and say you want to see Yoda. They'll direct you to the parking area. In one of the buildings you pass, you'll see the Walt Disney Family Museum, which tells the story of Walt Disney's life. It would take too long to stop there while following the 49-Mile Drive, but it's worth a visit on another day. Look for the Presidio Pet Cemetery on the left, just below the freeway overpass. This charming little burial ground contains the remains of beloved pets like "Three Fine Hamsters"
Go straight uphill at the stop sign onto Crissy Field Ave. At the next stop sign, merge onto Lincoln Blvd. At the end of the road, you'll find Fort Point. It's a Civil War-era structure with an interesting history, but you might not even notice it. That's because the Golden Gate Bridge tends to upstage it. Of course, you'll want to stop for photos. You'll also find restrooms at the parking area. Crissy Field is a park area along the bay's edge. It stretches from the bridge to the marina. All you have to do to enjoy it is walk away from the bridge along the waterfront. Go as far as you like and then turn and walk back. You may not need your mobile navigation for this short drive. In fact, if you're in good shape, you could just climb the steps above the parking area to get up to the Golden Gate Bridge vista point. If you want to drive instead, set your navigation to 955 Lincoln Blvd and park in the lot across the street from that address. The Golden Gate Bridge is possibly San Francisco's most iconic sight. Of course, you'll walk around and take pictures. Everyone does. You can walk just a little way onto the bridge - or all the way across and back. It's about 1.5 miles to the other side but halfway is enough for most people. You'll find restrooms in the vista point parking area. If you want to drive on the bridge, just follow the signs, get on the highway and drive north. You don't pay a toll going north, but you will have to pay to get back to where you started. Stop at the North Vista Point for a different view of the bridge and the city. Don't get stuck at the automated toll booth, not knowing what to do. Many people just drive right past this museum, noticing its elegant architecture. You won't have time to go in and see all the exhibits during your 49-Mile Drive, but you might want to return for that later. For a quick stop, you can get excellent skyline views from the parking lot. The famous sculpture The Thinker - you know the one I'm talking about, with that naked, muscular-looking guy resting his chin on his hand - is in the entrance courtyard. It's an original, but not the only one in existence. This is a good photo stop. You can also have a meal at the Cliff House, and the visitor center is worth a few minutes. You'll find restrooms at the visitor center and at the Cliff House. If you want to stop at the Cliff House, park in the lots just above it, or take your chances at getting a parking spot on the street. Nearby are the ruins of the Sutro Baths and on the back patio, you'll find a scientific curiosity, the Camera Obscura. The beach just below the Cliff House is Ocean Beach. The "official" 49-Mile Drive route continues on Great Highway past the San Francisco Zoo to loop around Lake Merced, but you will miss little by skipping it. It's hard to convince any GPS or navigation system to take you on the most interesting route through the park. If you're doing the drive on a weekday, follow these simple directions. Exit the park from its east end, going across Stanyan St. and through Haight Ashbury. 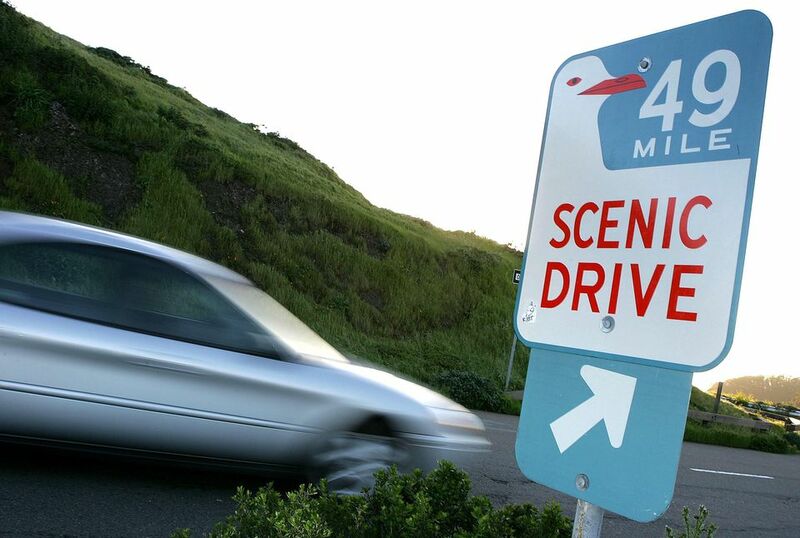 The official 49-Mile Drive doesn't go through Haight-Ashbury, but you will. Setting your navigation to "Haight Ashbury" will work on most systems. You can also use 1500 Haight St which is the corner of Haight and Ashbury Streets. The center of the "Summer of Love" still carries an aura of rebellion and grunge, although those who were there in the 1960s would probably say it's a shadow of its former self. You may want to stop for a few minutes of photos and shopping, or you could just drive straight through. Twin Peaks affords some of the best panoramic views of San Francisco - if the sky is clear enough. If it's cloudy, rainy or foggy and the hills have their heads in the clouds, skip this part of the drive by continuing on Stanyan, turning left onto 17th St and merging with Market where you can pick up our route again. Keep driving until you reach the vista point, where you'll see lots of parking spaces. Twin Peaks is a photo stop. You'll also find a self-cleaning pay toilet in the parking lot. Set your GPS to 429 Castro St which is the lovely Castro Theatre. If you accidentally go down Twin Peaks Blvd on the other side of the hill and find yourself looking at Portola Drive and wondering what to do, turn left onto Portola. It will become Market St. Turn right onto Castro and you'll be back on track. "The Castro" as it's usually called is rich in history. Many locations from the film Milk in which Sean Penn played San Francisco City Supervisor Harvey Milk are here, including Milk's camera shop. The grand old Castro Theatre is also here, showing lots of classic films. The mission's official name is Mission San Francisco de Asis but it's also called just Mission San Francisco or Mission Dolores. Entering just "Mission San Francisco" could take you to the part of the city called the mission district instead of to the historic structure. To get to the mission, set your GPS to 332116th St. It may give you a different route than the one below, taking you to the curb in front of the mission. If that happens, make a u-turn on Dolores to get back to Market St.
Mission Dolores is a Spanish mission founded in 1776. This tiny church is where San Francisco began, the site of one of California's oldest missions. Set your navigation to 200 Larkin St, which is the address of the Asian Art Museum, just across from City Hall. Turn left onto Polk St or Larking St and you will be in front of City Hall, near the city library and the Asian Art Museum. City Hall is where the "official" 49-Mile Drive tour starts, but where our version of it ends. If you have energy and are interested, you can make a side trip to Japantown and Fillmore Street by going north on Van Ness or Franklin and turning left onto Geary. This an excellent area for a little shopping, a movie or dinner. If you want to drive the rest of the interesting parts of the 49-Mile Drive instead of seeing them on foot, continue to Union Square. To get there from City Hall, set your GPS to 384 Post St. The "official" route of the 49-Mile Drive goes through Union Square, Chinatown, and other busy tourist areas. It's better to skip those parts in your automobile and instead start your drive going west on Bay St from Van Ness. If you're going to do that, skip to the route from Bay and Van Ness to the Palace of Fine Arts. However, if you want to drive the whole thing, start in Union Square. Drive around it until you are on Post, with Saks Fifth Avenue on the left and the square on your right. Union Square is great for shopping - or window shopping. And for people-watching. The 49-Mile Drive route takes you along Post to Grant St. Turn left onto Grant Street, going through the Chinatown Gate which is shown in the photo above. Drive straight through Chinatown for 4 blocks. Turn left again to go up the steep hill on California St.
An odd mixture of what early 20th-century architects thought a "Chinatown" should look like, a tarted-up tourist trap and a lively community of Chinese residents, Chinatown deserves more of your attention than it can get through a car window. You can shop in Chinatown. You could also have a meal in a Chinese restaurant, but we can't recommend any of them. The fun thing about Chinatown is just walking around, especially if you know how to get off the main tourist trail and explore its hidden places. Just a few blocks from Chinatown, California St enters Nob Hill, one of the city's poshest hilltops. Once the home of railroad barons and other wealthy citizens, it's topped today with high-end hotels and what may be San Francisco's most beautiful place of worship, Grace Cathedral. Nob Hill has few real "sights," but Grace Cathedral is worth a quick stop if you like great church architecture. Its bronze doors have an interesting history, too. If you want to look around here, there's a paid parking lot next to the cathedral just off California on Taylor. You may want to come back to Nob Hill later, going to the Mark Hopkins Hotel for a twilight drink at the Top of the Mark, which affords some of the city's best views. Jackson Square is one of the few places in this part of San Francisco that survived the 1906 earthquake and fire. Today it's home to antique shops and other home decor-related businesses. The "official" 49-Mile Drive route takes you through it, but it's not interesting enough to justify the difficult drive through it. Turn left onto Columbus from Vallejo St.
North Beach is an area that has been in transition for much of the city's history. It was once the home to so many Italian immigrants that it was called "Little Italy." Later, it became the epicenter of Beatnik culture. Now, it's predominantly Chinese according to the census (but not obvious by what you see on the streets). It's a great place to stop for a coffee and people-watching or come back to at night for dinner. A side trip to Coit Tower: Turn right on Grant and follow the signs. To return to your main route, drive downhill on Lombard St. to Stockton and turn left. Then turn right on Columbus Ave to continue. Detour to Lombard Street (most crooked street): Continue across Columbus to Lombard St. The famous crooked drive is one-way. Follow these steps to go around the block and get onto it: Turn left onto Leavenworth St, right on Filbert, right on Hyde and right again onto Lombard. At the bottom of Lombard, go straight until you get to Stockton, where you can pick up the next part of the route. From Columbus Ave, turn right onto Union St (just before the park). At the next corner, turn left onto Stockton St. The historic waterfront trolley shares this street with your vehicle. Be sure you stay off its tracks and far enough left to let it pass you safely. What's in the Miles You Skipped? Since we turned the official 49-Mile Drive into an unofficial 20-mile drive, you might wonder what happened to the rest of it. It's better to do the section from Union Square through the waterfront on foot. That's the part marked in blue on the map. That takes out a few miles. From Ocean Beach, the official route goes south to Lake Merced Park then back north up Sunset Blvd. It's a freshwater lake that's great for recreation, but not very scenic - and skipping it cuts out 5 to 6 miles of driving. That part is marked in gray on the map. After leaving Mission Dolores, following those cute seagull signs would take you through the Mission District, then east through an industrial area, past the baseball stadium. That part is also marked in gray on the map. Taking a shortcut to City Hall instead cuts off another 4 to 5 miles. What remains on this modified drive are the most interesting things to see - and you avoid the areas where it's too busy and hard to find a parking spot.